Spiga Wine Bar opened quietly in New Canaan a few weeks ago, offering a menu that combines old world Italian red sauce cuisine with modern interpretations of classic dishes. As reported in the CTbites Sneak Peek, the new owners redesigned the interior to offer a family focus for early guests followed by a hip environment as the evening progresses. During its opening weekend, my wife and I visited after a movie and then again with friends for a late lunch. On both occasions we were all impressed with the cuisine, but were a little taken aback by the noise. CTbites was subsequently invited by the owners to visit one afternoon to sample additional items, discuss the changes envisioned to the menu and how the owners are addressing the desire of guests to enjoy conversation with friends and family. Every visit to Spiga should start with a selection of their Italian meats and cheeses. Ours included Prosciutto di Parma, Soppressata and Porchetta, Mozzarella cheese and olives. Each of the meats offered a different level of spiciness, from the mild Prosciutto to the spicy Soppressata, and all of them were delicious. They can be ordered individually or as a group of one to four meats with Mozzarella. The menu includes numerous combinations of pizzas, from a simple Margherita to an elaborate “New England” with lobster. The crust of the rectangular shaped personal 12” pizza is crispy from edge to center, with only the slight bend in a slice when lifted. Some may choose to use a knife and fork; this might be a requirement for several of the “salad” topped pies. I sampled three different combinations. My favorite was the “Calabrese,” which combined a layer of melted Mozzarella cheese and San Marzano tomato sauce, topped with the spicy Sopressata Calabrese and finished with drizzles of hot oil and honey. This sweet-spicy combination offered great heat from the sopressata and the hot oil, offset by a drizzle of the sweet honey. The cheese mellowed the heat and the sauce added even more sweetness. The “Di Parma” started with melted fresh mozzarella plus chunks of fresh tomatoes and topped with a large mound of lightly dressed arugula and a generous portion of San Danielle prosciutto. The prosciutto was outstanding, with a delightfully soft texture and the cheese and sauce were delicious. I was not as big a fan of the dressed arugula as others, preferring an undressed version. I was a little apprehensive when the “Roasted Beet” pizza was delivered. It included San Marzano tomato sauce, arugula, cubes of local roasted beets, goat cheese and drizzled with Balsamic reduction. This melding of a salad and pizza was very tasty. The cubes of beets worked well with both the mozzarella and the creamy goat cheese, adding a sweet earthiness to the dish, balanced by the peppery (and in this case undressed) arugula. 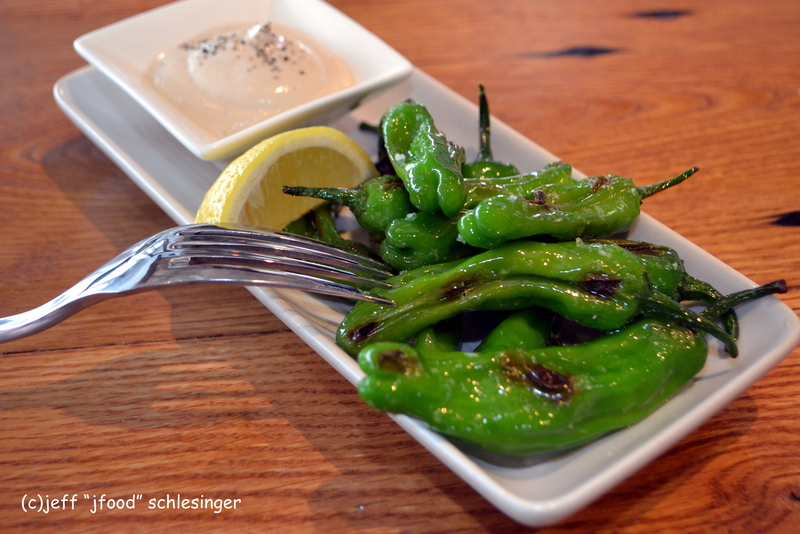 I sampled three of the small plates during my visits. My favorite was the “Fried Meatballs” topped with San Marzano tomato sauce, basil and Ricotta cheese. The meatballs were excellent, soft on the interior, surrounded by a crispy exterior and delivered great flavor with just a hint of garlic. The sweet San Marzano sauce was fantastic and the dollops of Ricotta added great creaminess to the dish. I also enjoyed the “Roasted Brussels Sprouts,” and included a large serving of fried sprouts, paired with crispy pancetta pieces and finished with a honey truffle oil. The sprouts were perfectly fried, crispy on the edges and still firm throughout. The fried pancetta added wonderful salty-smoky flavor and with the cheese added just enough salt to perk the palate. The last small plate was the “Portuguese Grilled Octopus” that was served with crispy Coppa, baby potatoes, and micro greens. The octopus was very tender, but the texture was off-putting and spongy, and it would have benefitted from a charring on the exterior and the soft textures continued with the potatoes. The crispy Coppa added a slight crunch to the dish, but the current version was not to my liking. There are numerous salads, with my favorite the “Farro and Quinoa Salad,” served with avocado, cucumbers, scallions, heirloom cherry tomatoes, grilled fennel and finished with lemon-EVOO. The quinoa was a great earthy canvas for the other ingredients. The sweet cucumbers and tomatoes were balanced by the fennel and scallions, and brightened by the lemon dressing. Another large salad was the “Campagna Salad,” with spinach, golden apples, fresh pears, roasted walnuts, cranberries, Gorgonzola cheese, and Balsamic vinaigrette. A large mound of spinach was surrounded by the sweet thinly sliced fruits, crunchy nuts and pungent cheese. Each forkful brought a different combination of flavors. With pastas ranging from a home-style spaghetti and meatballs to lobster fettuccine, I decided to try a rich pasta and a light pasta. The “Short Rib Ravioli” was made in-house with a rich, meaty short rib filling encased in a thin pasta sheet and served with a wild mushroom marsala sauce. The deep flavor of the meat was complemented by the earthiness of the wild mushroom and the Marsala sauce. 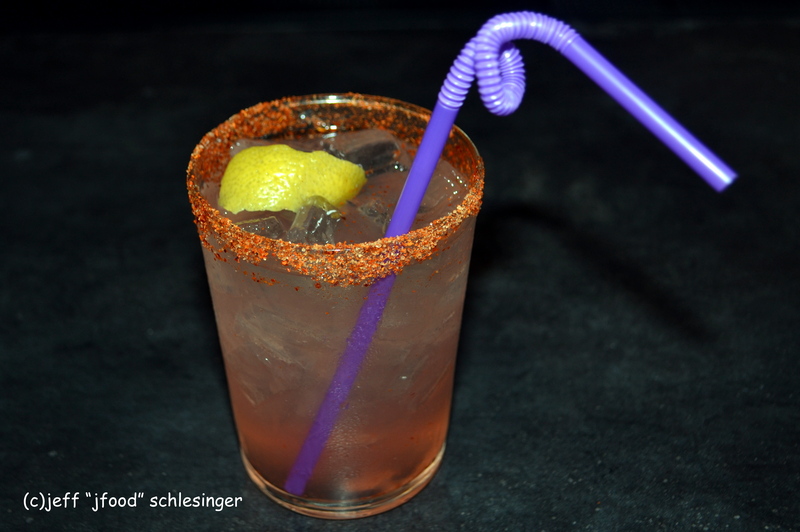 As the cool weather arrives, this will be an excellent comfort option. On the lighter side, the “Linguini Vongole” was very good. A medium portion of house-made linguini was served in a simple clam broth, with an abundance of cockles, baby clams, roasted garlic, and seasoned with parsley and red chili peppers. The broth was flavorful with a hint of garlic. The pasta was just a touch on the thick side, and the pasta and shellfish were slightly overcooked. The “Market Cioppino” was excellent. A bowl of lobster, shrimp, calamari, swordfish (this changes daily) and clams, swimming in a seafood tomato broth was served with grilled crostini. Each was perfectly cooked and maintained a soft texture. The broth was delicious. A little red pepper flakes on the table for those, like me, who prefer a little more heat would have made this a perfect rendition. Overall, Spiga is delivering wonderful pizzas, small plates, salads and main course. I asked the owner about the noise and he told me that they purchased sound dampening material that is being installed throughout the dining area. Likewise, Spiga’s opening menu was very large (this is the owners’ first venture into New Canaan) and they wanted to understand the likes and dislikes versus their other restaurants. Over the next few weeks, the menu will more align with the tastes of the New Canaan guests. Many thanks to Janes Beiles of Jane Beiles Photography for these wonderful photos. The author was compensated for this review; the meal on the last visit was provided without charge. The opinions contained herein are solely those of the author. 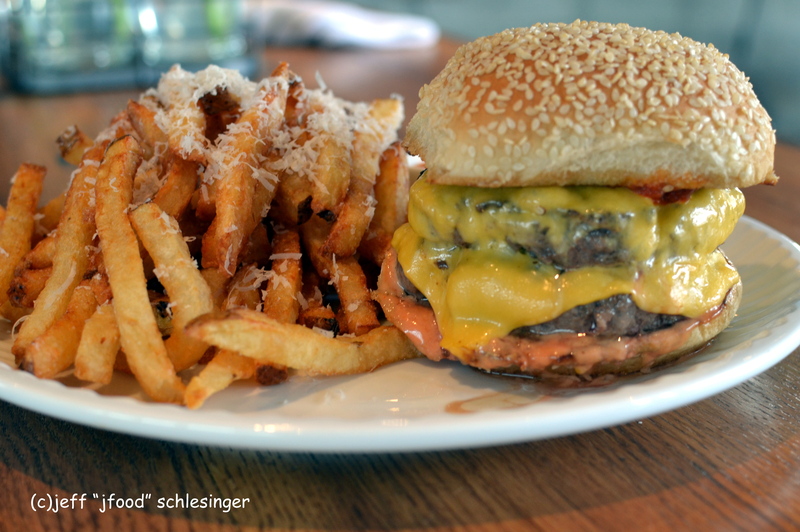 The burger served at Elm Restaurant in New Canaan has been a perennial inclusion in my favorite burgers since it opened. 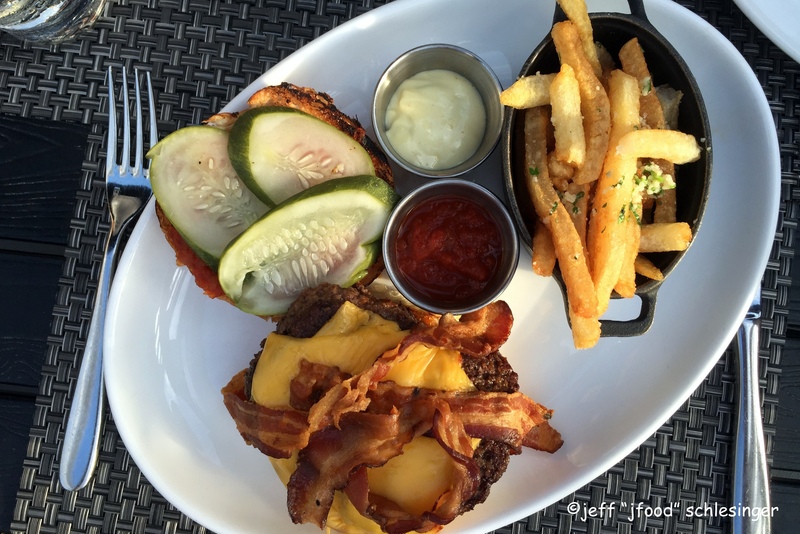 Last year Chef Luke Venner assumed the hem as Executive Chef and he recently introduced the “Dry Aged Burger, double-double, animal style.” I was curious to this major change from the previous thick single-patty to the twin-patty thin style. After my visit I asked Chef Venner about the change and he told me that the new addition was the result of him introducing this version at a recent pop-up and receiving so many requests to place it on the menu. I sat the bar, ordered the burger medium-rare and enjoyed watching old movies projecting onto the rear wall. When the burger arrived the first item I noticed was its height, rising at least five inches above the plate. A metal tin filled with French fries accompanied the burger. “Animal Style” refers to the quintessential west coast burger chain IN-N-OUT Burger. This designation was traditionally found only on the “secret” menu (that everyone knew about) and referred to a layer of mustard slathered on the patty prior to grilling. At Elm, Chef Venner uses this term to describe his interpretation as “fully dressed” with a twist to the grilled mustard. Elm’s burger includes two thin patties of dry aged beef blend from Pat LaFrieda topped with slices of American cheese, pickled kohlrabi, shredded lettuce, tomato, and a house-made sauce that includes ketchup, mayonnaise, mustard, burnt onions, shiro dashi and other secret spices. All of these items were encased in a sesame seed Brioche bun. The meat was wonderful, deep and rich and were dense, highly compressed, and still maintained a high level of juiciness. The cheese was incredibly creamy and perfectly melted. Then the sauce and kohlrabi kicked in and it was outstanding. The “Animal Style” effect was achieved by grilling the onions directly in the sauce, which intensified the flavors. The paper thin kohlrabi delivered a delightful sweet-sour combination which was balanced with the sweet tomato. The sauce was one of the best additions in the area, the shiro dashi brought an incredibly depth of flavor to the mayo-ketchup-mustard playfulness. The brioche‘s sweetness was the perfect choice for the other ingredients. The combination was incredibly delicious. The fries can be a challenge, they were fantastic on one visit and were not as great on another. Overall this is one of the best burgers in the area. I am glad that the people who tasted it at the pop-up demanded Chef Venner place it on the menu so others can enjoy this fantastic rendition. When is Gates opening? How many of us have been asked, and have asked others, that question? Good news…the anticipated re-opening is almost here and CTbites was invited by the new owners to sample several of the items that will be featured on the opening menu. Gates, an institution that opened in 1979 as the first restaurant on Forest Street, was sold last year, and many residents compared the closing to the loss of an old friend. Residents who have enjoyed a burger and beer at the bar or a family dinner in the dining room should feel a sense of excitement when the doors re-open very shortly. Those who have longed for that burger and beer at the bar or a family dinner in the dining room will again enjoy their meals at Gates – and yes, the name will remain ‘Gates.’ Diners will also find comfort in the direction that the new owners are taking to maintain the modernized nostalgia of this New Canaan institution. Gates is part of a larger, historical New Canaan institution that dates back over 125 years. Before looking at the new Gates, let’s rewind the calendar to 1882, when Henry B. Rodgers purchased, demolished and built the current structure using 650,000 bricks that were transported to Stamford by boat and on to New Canaan. Formerly a shoe factory, Rogers converted the space to manufacture clothing for the newest rage of that era, bicycling. Over the years it housed a shoe company, a linen shop, a drug store and a beauty shop. The first New Canaan gas lamp was situated in front of the Main Street entrance and Rogers was one of the first four residents in town who owned a telephone. The building has been embedded in the history of town and will be for years to come. The interior of Gates has undergone a complete renovation under the guidance of Company K, a New Canaan based interior design firm. It now showcases the previously hidden brick walls and wooden beams. The new layout presents an open kitchen with “kitchen-bar seating”, and wood-topped tables under a newly coffered ceiling gently illuminated by retro lighting. The original iron gates that previously adorned the hostess area have been reconditioned and are floating between the bar and the dining area. The centerpiece of the new bar area is an amazingly striking, refinished crafted metal bar fabricated by local artisan, Chris Curnan. 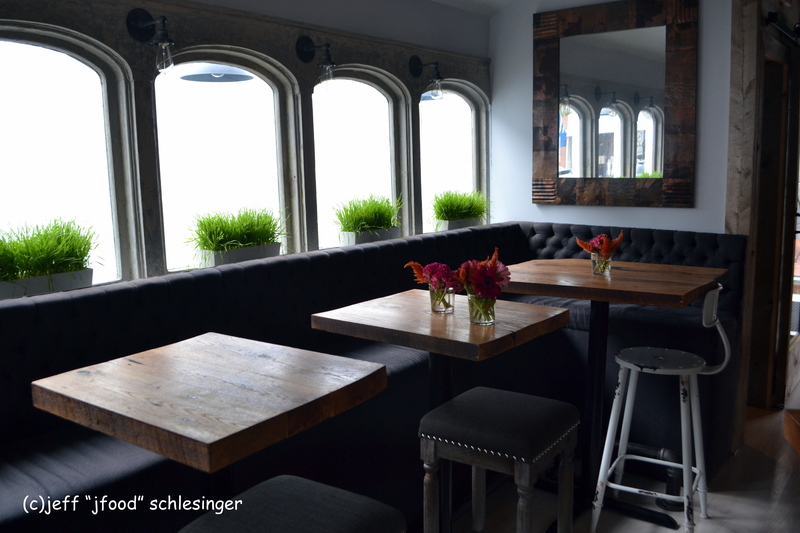 Wood and metal booths offer an urban vibe for those looking for a more casual dining experience. The beverage menu highlights a wide selection of beer, ranging from local CT breweries to international favorites. The glass-front refrigerator behind the bar sports additional large and small label selections. Live music will be an occasional addition when dinner service begins to wind down on Saturday nights. The culinary concept for the new Gates is American comfort that, “will bring passion, heart and soul to the food.” It will feature a wood burning oven for a selection of artisanal flatbreads, plus a wood burning rotisserie to slow cook a variety of meats and poultry, each prepared to “melt in your mouth.” While these items act as the centerpiece for many of the entrées, they will also serve as the foundation in all of the sandwiches on the lunch menu. The opening menu will include a burger and hand-cut fries, Rotisserie Chicken, and assorted fresh fish and steaks. Several of these items were served during the pre-opening tasting and were delicious, an excellent indication of things to come. The new Gates will be a destination for adults and families seeking a delicious meal, sports enthusiasts seeking a beer and burger in the bar, beer lovers thirsting for a wide selection of international and local brews, and couples looking to end an evening with a little live music and a nightcap. Stay tuned as CTbites continues to provide additional details on the re-opening of Gates. 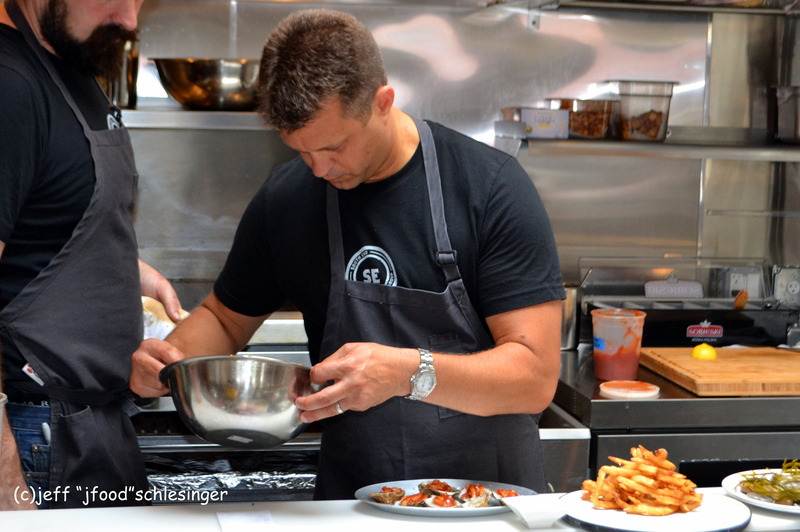 Chef Luke Venner has been at the helm of elm Restaurant for several monthsand was invited to participate at the Greenwich Wine and Food Festival as one of the Innovative Chefs. The two small bites that he prepared at the festival were delicious. In hopes that these were reflective of his newly revised menu, CTbites returned to the restaurant to sample other dishes on his recently introduced Autumn menu. The appetizers and entrées that we enjoyed highlighted the inherent flavors of the ingredients utilizing Chef Luke’s balanced vision and delicate touch. We shared three dishes from the “smaller” section of the menu. With the arrival of Fall, menus are featuring soups to showcase the season’s harvest. Chef Venner’s Pumpkin and Apple Soup was a sweet-spice combination mellowed by the pumpkin’s earthiness. These Autumnal flavors were a fantastic combination and the preparation included interesting back-notes from a smidgen of star anise. The spicy marshmallows were a playful inclusion for additional sweetness and a sudden burst of spiciness from the chili pepper. The Tuscan Kale salad was served with thinly sliced honey crisp apples, intermingled with chunks of Cheddar cheese and bacon. This good-sized portion paired the mild bitterness of the shredded kale with the sweetness of apples. The presentation was further enriched by the Cheddar cheese and chunks of some of the best bacon I have eaten in some time. The Delicata Squash Tartine started with a slice of toasted bread that was topped with ricotta, slices of roasted squash and sprinkled with spiced pecans. The squash rings were first caramelized to heighten their natural sweetness and were perfectly complemented by the wonderfully smooth ricotta. The pecans added more earthiness and a textural difference. This was a delicious start to the meal that I would describe as a more petit starter. The entrées, “larger” plates, I sampled included two of the steaks and the risotto. My favorite of the entrées was the Smoked Shortrib, which shared the plate with pureed carrots, slices of charred cucumber, and a dollop of chimichurri. The beef was first brined for two days, smoked and then pressed to remove all of the inherent fattiness of this cut. The filet was finished with a mild sear. The result was incredibly tender with a deep, rich flavor that required nothing more than a fork to cut. The charred cucumber slices added an interesting sweetness, the Sriracha enhanced carrot purée offered a touch of spiciness and the chimichurri complemented the other ingredients with sour notes. Elm’s Wagyu Rib Eye is purchased from the 7X Ranch in Colorado. A little background of this ranch and its beef is important. While the requirement in the US for Wagyu designation is at least 25% from a Japanese Wagyu steer, 7X is 100% derived from Japanese Wagyu steer. The result is a softer, well marbled steak. The Wagyu rib eye was glazed with a Bordelaise sauce and served with a large marrow-filled bone. The meat was mild in flavor and presented more of a strip steak texture than rib eye…and was delicious. The portion was sufficient for two to share or for a single with a very hearty appetite. There are numerous risottos offered throughout the area, most with a certain amount of heaviness. Elm’s current Risotto is delicate and pairs creamy Carnaroli rice with wild mushrooms, black truffle enhanced mascarpone and topped with thin slices of orange peel. The focus was the truffle infused mascarpone elevated by the brightness from the orange peel, a combination that I have never experienced, plus the mild earthiness from the mushrooms. It was outstanding and a much lighter version of this traditional Italian dish. To accompany the entrées we also shared a side of Brussels sprouts. A bowl of baby sprouts was topped with honey and lavender that delivered a very sweet interpretation with a touch of floral notes. They were also excellent. Pastry Chef Kara Koehmstedt recently joined elm to oversee its dessert and bread program. Chef Kara was trained at the Culinary Institute of America before joining the culinary team at The Peninsula Hotel and Blackbird Restaurant in Chicago and Cosme in NYC. She prepared four of her desserts from the current menu. The highlight was the Zeppoles, which now rank as my favorite rendition in the area. The interior was moist from the Ricotta cheese and presented a wonderful texture to complement the crunchiness of the crust. Each was encased with cinnamon-sugar that offered the perfect balance to the zeppoles. They were paired with peach jam and maple ice cream and everyone at the table was craving a little chocolate sauce for their portion. The Pumpkin Cheesecake delivered a rich creaminess reminiscent of NY-style cheese cake. There was additional smoothness from the formage blanc mousse, while the crumbles of specaloos (ginger biscuits) added a crunchy textural difference. As much as I loved the textures the pumpkin filling, the dish was a little heavy with nutmeg and the specaloos contained a little too much ginger. The elm Brownie was several bite-sized pieces served with Crème fraiche ice cream and roasted blackberries. The highlight of the dish was the blackberries that were very sweet and delectable. The brownies were mild in flavor as was the ice cream and I prefer a more chocolatey brownie. The Boozy Sundae is the newest addition to the dessert menu and included a large dish of soft brown sugar Bourbon ice cream topped with swirls of chocolate and caramel sauces and finished with pecans. The ice cream and sauces were excellent but the pecans were much too salty and overwhelmed the other ingredients. Overall the appetizers and entrées were some of the most creative and delicious food I have eaten in Fairfield County. The subtleness of the combinations were fantastic. I look forward to returning to elm and taste many more of Chef Venner culinary compositions. Prices range from $12 to $21 for the smaller plates and $21 to $36 for the larger plates (with the exceptions being the burger at $18 and the Wagyu ribeye at $62). I found most of the portion sizes in line with those at other high-end restaurants in Fairfield County. From the moment you walk through the rear wood-hewn door you understand the concept behind the mantra of Snacks and Taps. Guests enter a dining area like none in New Canaan. The entire right wall is filled with a single banquette, the center of the dining area has several wooden high top tables and the bar occupies the entire left wall with thick wooden shelves holding the libations for the guests. The front of the room has a long wooden bar shelf with a “pass-through” to hand guests dining outside their food and drinks. The atmosphere is casual, laid back, kick up your feet, eat great food, watch the ball game on two separate TVs and have a few beers, a couple of glasses of wine and hang out with friends. 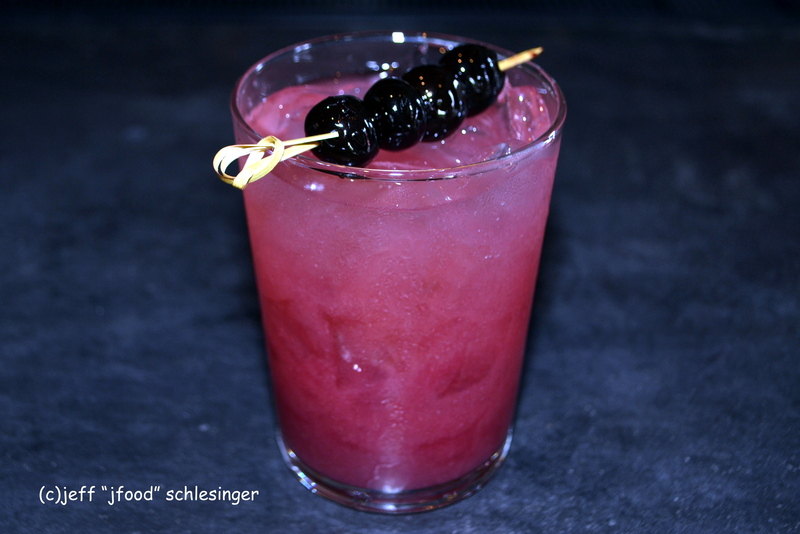 The menu is geared to creative fare and filled with an array of bold and delicious options. 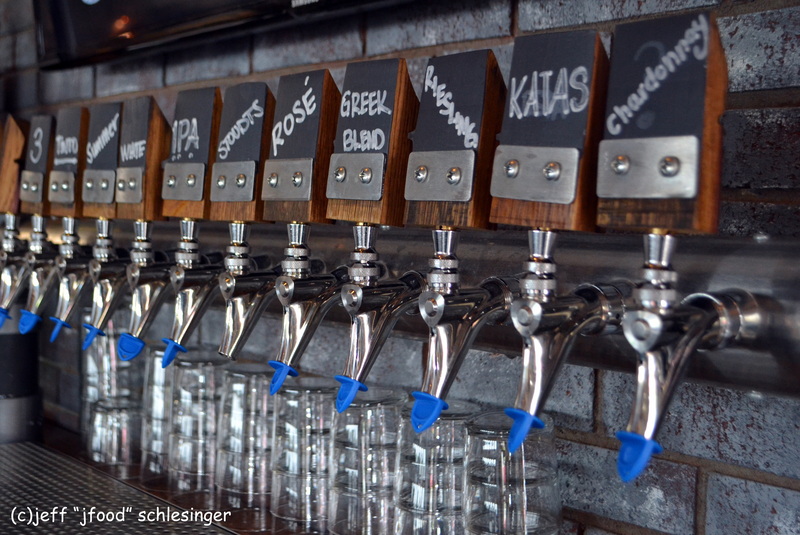 Uncorked pours all the beverages from taps or individual bottles and cans with four beers, ten wines and two waters on tap, plus a wide selection of local breweries and national brand beers. Likewise all of the juices are made in house and mixers are poured from bottles and cans. The menu is divided into smaller and larger selections and I sampled several of each. 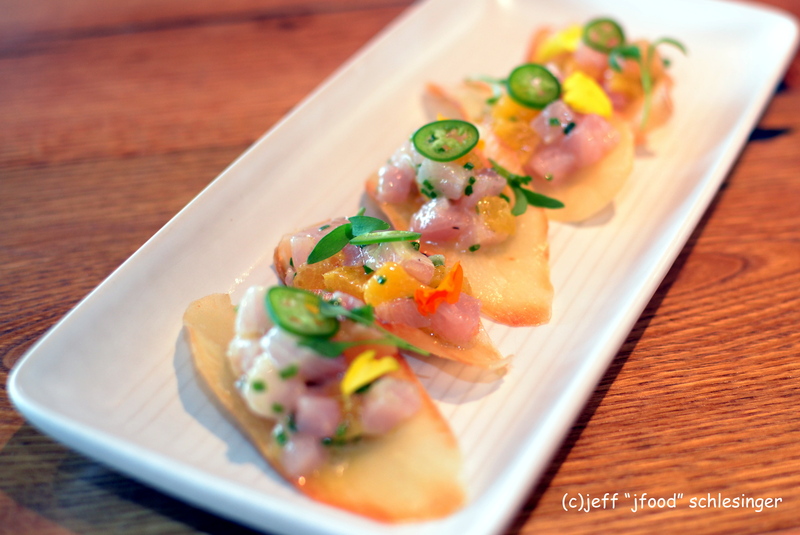 Fish and sushi lovers should choose the Hamachi Nachos, a delightfully refreshing small plate of sweet and spicy. Freshly flash fried yucca chips were topped with large cubes of Hamachi that were marinated in grapefruit and orange juices, garlic and shallots. They were served with an orange section, cilantro oil and finished with a thin slice of Serrano chili and a sprig of micro cilantro. This cerviche on steroids delivered an amazing array of flavors and textures from the sweetness of the oranges and spiciness of the serrano chili to the soft and delicate fish to the crunchiness of the yucca. 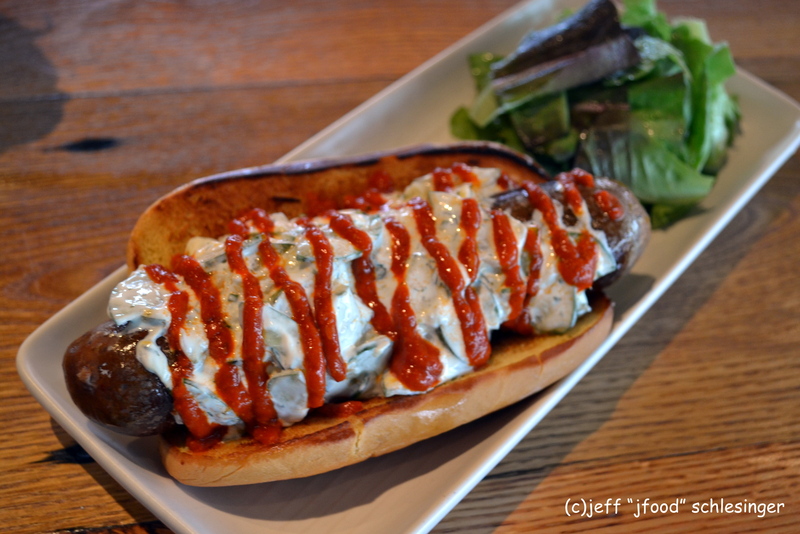 For the adventurous, the house-made Merguez sausage sandwich was fantastic. It was served on a long Martin potato roll and accompanied with Tzatziki and swirls of harissa sauce. The sausage was wonderfully seasoned with a minimal level of spiciness. The creaminess of the sweet Tzatziki and the spiciness of the harissa were great fantastic together. Choose one of the beers for this sausage. There are two very different carpaccios. Creating a complex dish from a few simple ingredient is the foundation of the Scallop Carpaccio. Thinly sliced scallops were marinated in lemon juice, Espelette pepper and red pepper and presented with dollops of pickled mustard seeds, slices of radishes, olive oil and thinly sliced serrano chilies. The scallops were sugar sweet with just a touch of citrus and a background of pepper. The pickled mustard seeds elevated the dish with great sour notes and for additional spiciness, pop one of the chili slices on the fork. 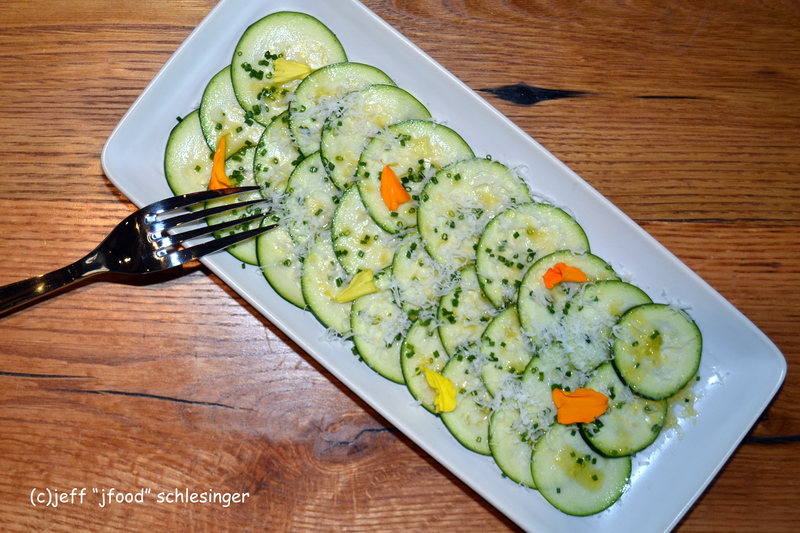 The Zucchini Carpaccio was presented in a fish scale pattern with a touch of grated Pecorino and drizzled with olive oil and salt. This refreshing dish accentuated the simplicity of the zucchini with just a hint of salt from the cheese. It would be a great accompaniment with a glass of brisk white wine to begin the meal. 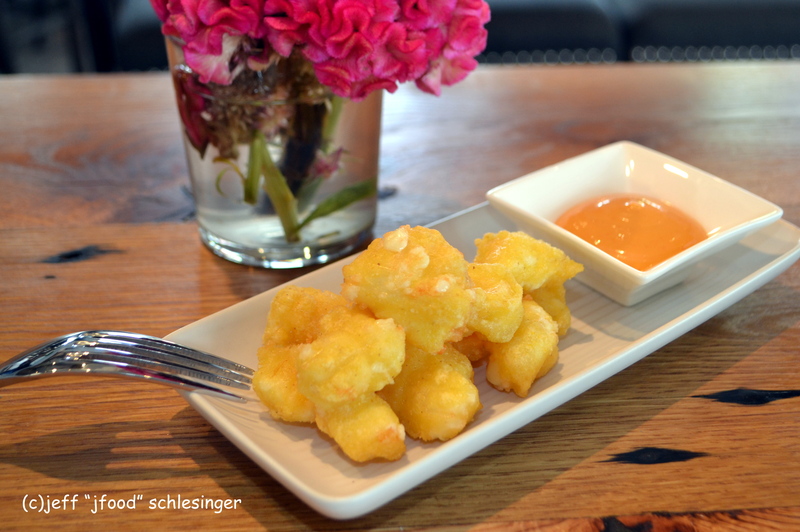 The Fried Cheese Curds included bite sized pieces of Wisconsin cheddar cheeses that were lightly coated with a mixture of beer, cornmeal and flour and flash fried and paired with a Sriracha aioli. The mild cheddar was a perfect canvas for the spiciness of the Sriracha. Order the curds with a light beer for a great snack. Uncorked’s rendition of Shishito Peppers began with quickly blistered peppers, which were joined with an aioli that contained a surprising ingredient, poached tuna. When the mild peppers (beware that about one in ten is very spicy with no advanced warning) were dipped in the aioli, the combined flavors were delicious and distinctive. As a tribute to the bars of Australia, Uncorked also serves Oysters Kilpatrick. 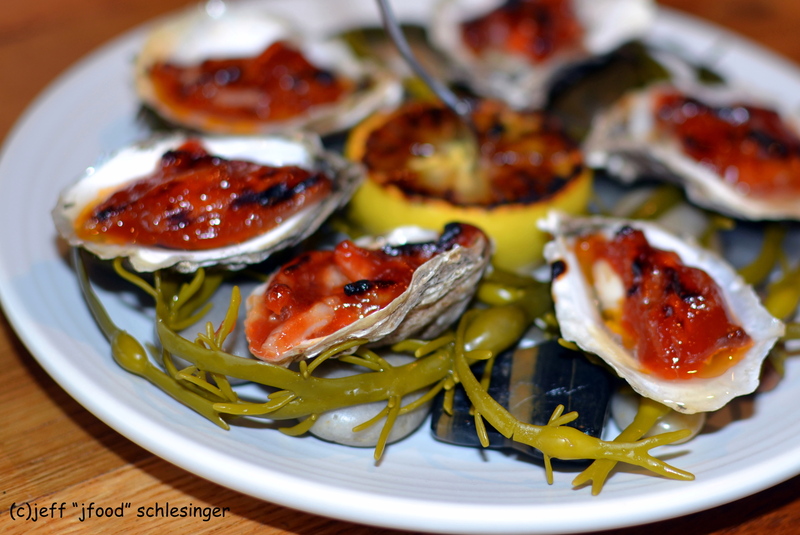 The roasted oysters were topped with Benton’s bacon and a house-made BBQ sauce. The combination was very bold from the bacon and sauce and I thought the sauce overpowered the oysters. The entrées include a variety of options including meats, fish, and chicken, plus another great burger. No less than three months after South End tied for my top burger in southwest CT, Chef Nick created the Double Double. 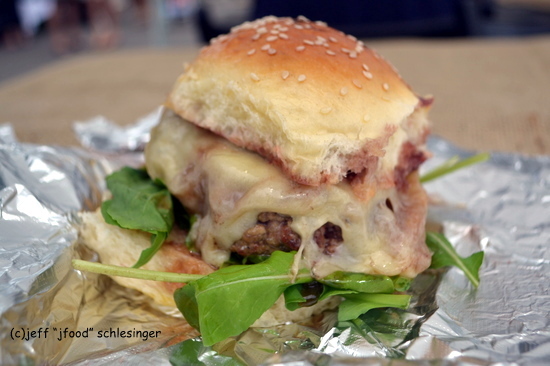 The only similarity to the South End burger is it will be a serious contender for next year’s top spot. The patties were seasoned with Worcestershire sauce and slowly cooked onions, seared to medium-rare and joined on the toasted sesame seed bun with thinly slice zucchini pickles, melted American cheese and SE (South End) burger sauce. The Worcestershire sauce and onions added wonderful depth to the meat and the zucchini pickles were a lighter touch than traditional pickles. The burger was accompanied by some of the best fries in Fairfield County. A dish that exploded with a combination of flavors is the Chicken. The chicken was marinated in a mixture of coconut, lemongrass and ginger, slow cooked and finished in a hot pan. It was served atop a bed of crispy olive oil potatoes and served over a large swath of leek purée and a drizzle of leek oil. 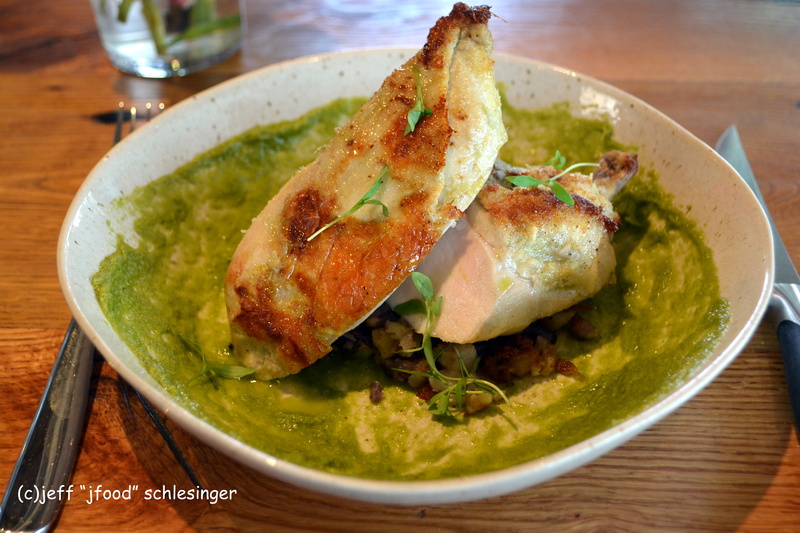 The chicken offered a beautifully crisped skin and a moist and buttery texture, with tropical back-notes with potatoes that were incredibly crispy. A single forkful of all of the ingredients was outstanding. For those looking for a steak dinner, Uncorked offers a Kobe Flat Iron Steak with a complex butter and au poivre wine sauce. 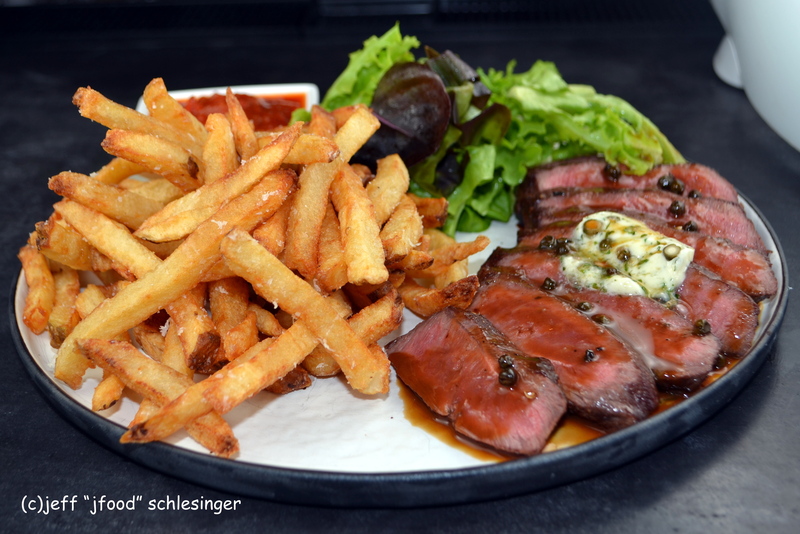 The steak was perfectly prepared to medium-rare, sliced and accompanied by French fries and a small salad. The beef was rich in flavor and the sauce and butter added a wonderful lusciousness to the dish. The fries were fantastic and created a more pubby presentation to enjoy with a beer or a glass of red wine. For a lighter entrée, Uncorked offers a Coriander Crusted Sliced Tuna over a Panzanella salad, which included pickled red onions, sliced heirloom tomatoes, plus fennel and basil from Uncorked’s garden. The rare slices delivered a Middle Eastern twist, while the salad offered robustness from the tomatoes balanced with the bright acidity of the Banyuls vinaigrette. The croutons made from house-made bread offered a wonderful textural contrast. Save room for dessert because Uncorked is serving two incredible throwback desserts. The first was an interpretation of an Ice Box cake, but I would call it a dense chocolate pudding pie. A wonderful graham cracker crust was filled with the creamiest and most delicious chocolate pudding I have tasted in a long time and topped with vanilla gelato and swirls of chocolate sauce. 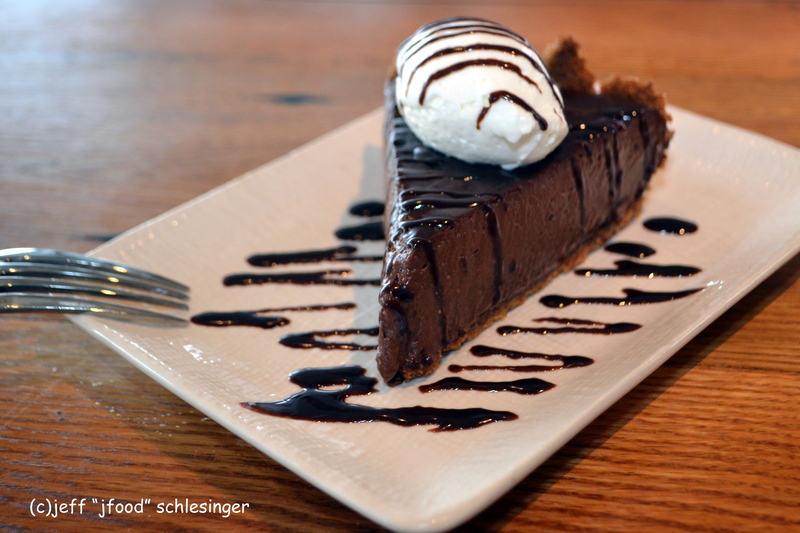 This was a must-have dessert. The other throwback dessert is a tribute to Chef Nick’s childhood when his grandparents would take him for spumoni. 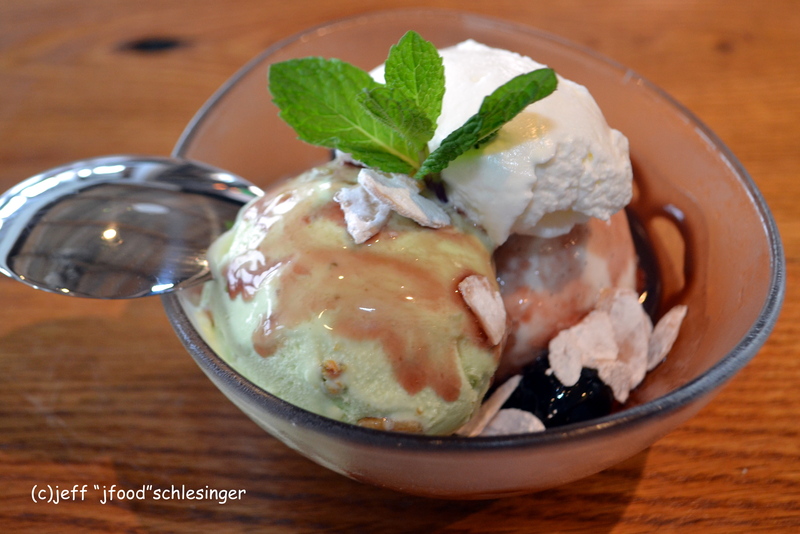 Scoops of vanilla and pistachio ice cream were topped with fudge, toasted almonds and Luxardo cherries, and finished with a dollop of whipped cream and a sprig of mint. It was full of great flavors from the sauces and the Luxardo cherries were a delightful addition. 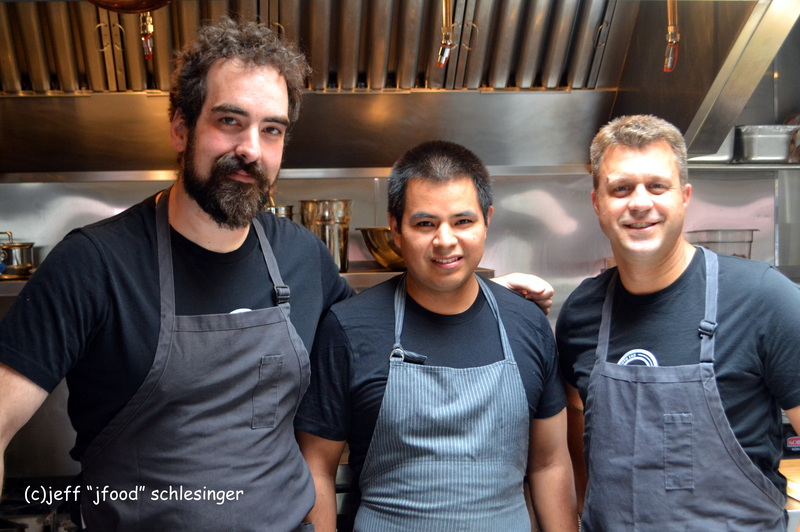 Overall, Uncorked presents an atmosphere that is alive and the food is vibrant and delicious. Chef Nick and his team have done an outstanding job in creating another go-to spot in New Canaan. 2015 was a difficult year in choosing the number 1 burger in southwest CT and the coin flip did not help. In the end I decided that it was a tie between South End in New Canaan and Harlan Social in Stamford. The “South End Burger” created by Chef Nick Martschenko starts with fantastic beef, topped with Benton bacon, American cheese, South End burger sauce and served on a poppy seed roll. The flavor of the meat is perfect, and Chef Martschenko chars the exterior while maintaining a medium rare interior that oozes tons of juicy goodness. 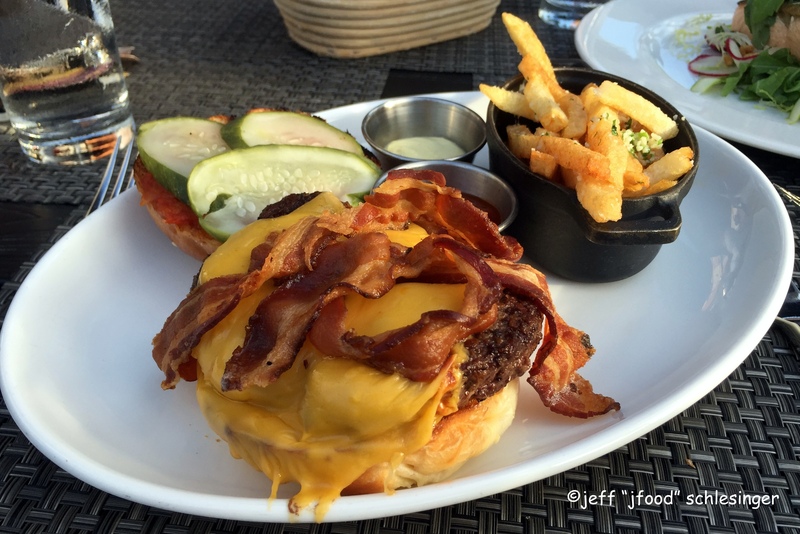 The bacon is crisp and flavorful and complements the meat. A few slices of B&B pickles adorn the burger and add another delightful sour component and the melted American cheese encases the patty. The sauce was a chunky spiced ketchup-y delight, which adds another flavor level. The roll was light and allows the other bold flavors inside to shine. The fries are delicious, lightly salted with a dusting of parmesan cheese and is a great partner for the burger. A lot of trucks sell burgers…Bounty Food Truck is the only one I found that sells one that is is great and should be included in my Best Burger List. Over the last year I enjoyed both the Bordelaise Burger and the Bounty Burger and each could make the list. The “Bordelaise Burger” was outstanding. The meat was full of deep rich flavor and juicy, and then it was grilled to a perfect medium-rare. It was next topped with melted Gruyere cheese, which added a touch of creamy nuttiness. The slight pepperiness of the arugula was a fantastic addition and also contributed a little crunch. The caramelized onions were sweet and added just a touch of sweet back-notes and then the Malbec butter kicked in with a bold earthiness and a little pungency. The “Bounty Burger” began with the same great meat, again prepared to a perfect medium-rare. 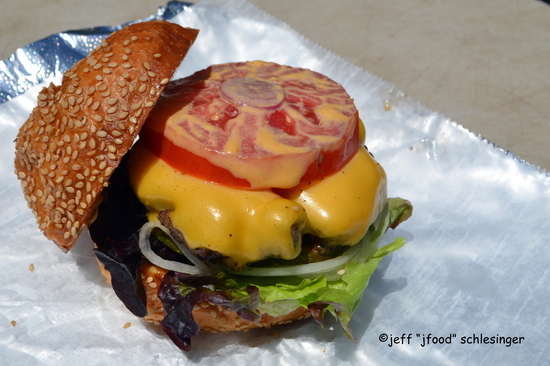 This included traditional toppings of melted cheese, tomato, lettuce and onions in a sesame seed bun with a swath of Bounty sauce. The juicy meat and tomato slice was complemented by the slightly sweet sauce. It was a great burger. 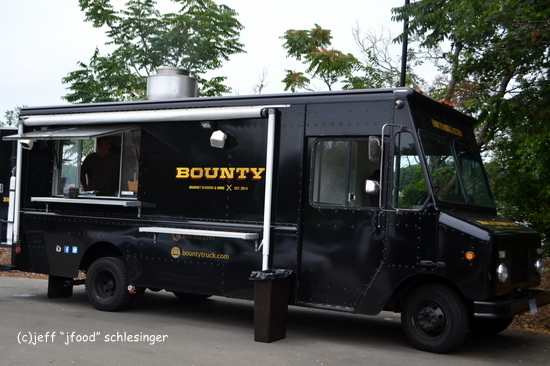 I am glad Bounty will park at the New Canaan Farmer’s Market this summer where I can sneak down and grab a great burger every Saturday.